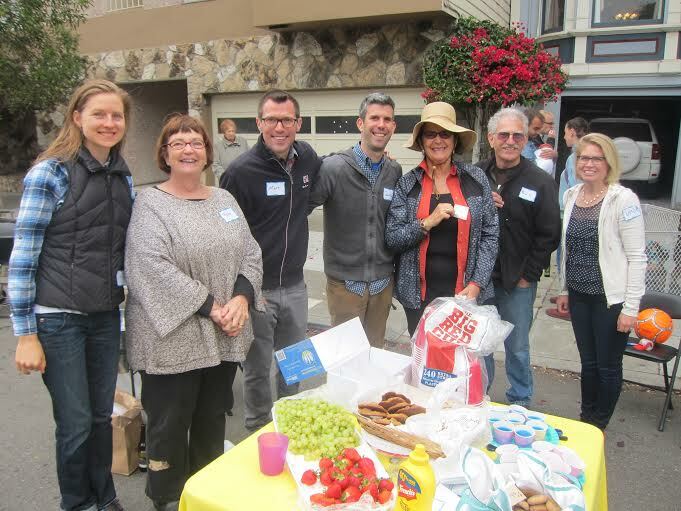 Block parties (1400 block of 12th Avenue in SF seen here) enrich neighborhoods. So why not encourage them? Photo: Adam Greenfield. 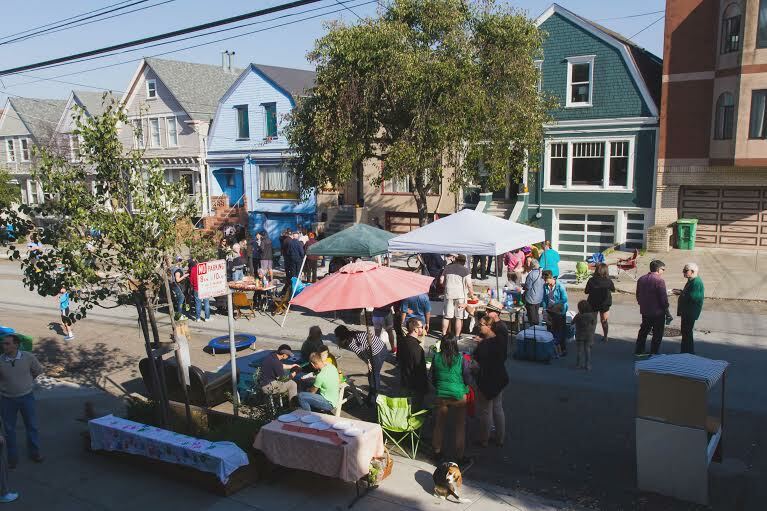 When neighbors reclaim their street for a day and turn it into a car-free social space, all types of folks come out. Children run freely and neighbors who have been strangers for 20 years meet at last. Culture changes in an instant: Streets become safer, social ties strengthen, neighbors are happier and healthier. Unfortunately, many American cities are not so sympathetic. Recently, I conducted a survey of every American city with a population of over 300,000. I discovered that some cities are charging up the wazoo for neighbors to organize block parties. The biggest humbug is Austin which charges $558. Bear in mind that the most common permit cost is $0 and the median cost is $20. Embarrassingly, my own city of San Francisco charges $167, the nation’s fourth highest fee. For a longer, more detailed list download the raw data. So, in addition to reducing or eliminating permit costs, many cities need to improve their block party application process. And they should. Those who organize block parties are doing a service to their neighbors and to society. They should be thanked and encouraged for doing so. Tell us what you think. Have you ever organized a block party? Do you think they cause long-term change/more community involvement in a neighborhood? Comment below. 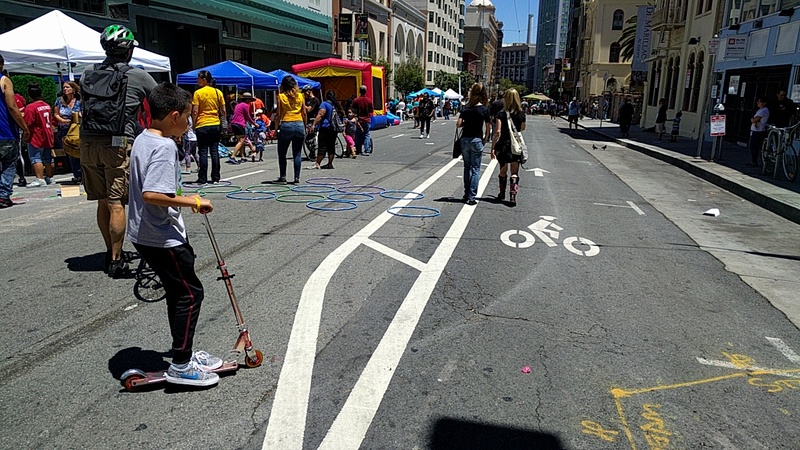 Block parties and other open streets events (such as Sunday Streets Tenderloin, seen here) can bring long-term neighborhood change. So make them cheap to set up! Photo: Streetsblog. Adam Greenfield is a community organizer and public-space advocate based in San Francisco, California. A version of this article first appeared on his blog, The Plaza Perspective. So does just about every other use of the streets, minus the anti-social comment. That’d be awesome to apply to parking. You can’t do that–you’ll totally deflate his “If detours are no problem then let’s have a party on the Wiggle!” zinger. Except that the roads were specifically designed to accommodate parking. We the people voted for and paid more taxes precisely so that the roads were designed in such a way that when we arrive at our destination, we can actually stop there! I’m still waiting for someone to deflate that zinger. But it’s only been 5 days. I recall reading about how parking slowly left the garage and caused all sorts of havoc as people started leaving vehicles on the street. Suddenly new laws and restrictions had to be invented. You don’t have to invent space in a neighborhood, you have to invent restrictions. Street parking isn’t a thing in some places. In cities where there is plenty of garage or off-street lots, like LA, it’s common to not have or use street parking. But in SF I would assume that the voters decide to support politicians who made sure that the roads were built wide enough to allows for parking lanes as well as traffic lanes. In SF I would assume that the voters decide to support politicians who made sure that block parties were an ok use of the roads as well as for traffic most of the time. Block parties do not happen “most of the time”. They happen very rarely and only at quiet times and on quiet days. No, they don’t happen most of the time. Nor did I intend to claim they do. In SF voters decide to support politicians who made sure that block parties were an ok use of the roads. I doubt that any voter has ever changed who he or she votes for based on their position on block parties which, I am happy to read, you now agree do not happen “most of the time”. They may well change their vote if their parking is taken away from them, which would affect them most of the time. In fact it might turn their life into a nightmare which, I concede, probably isn’t true of block parties. "It’s the second bi-annual block party on 18th Street featuring the tastiest neighbors in Gourmet Gulch. Locally made and crafted food and beer, children’s entertainment, a pie contest, DJs and of course SFBC’s own free valet bicycle parking. All proceeds benefit the Women’s Building, BuenDia Family School, 826 Valencia, Next Course & Pie Ranch." Oakland is a city known for its beautiful murals. But what about painting a "mural" not on a wall--but on the street itself?